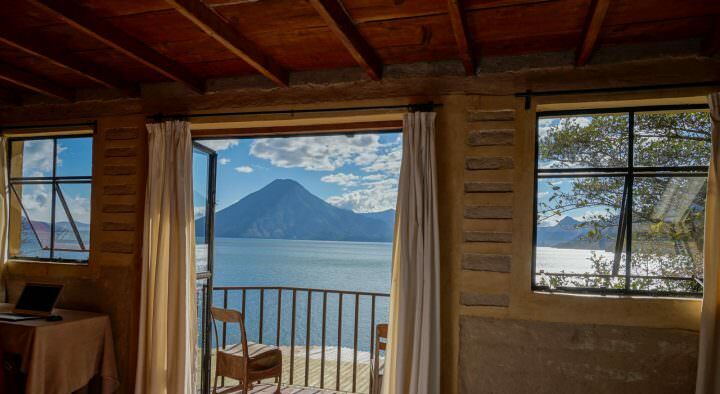 Known for its indigenous culture, cheese, mole sauces, chocolate and coffee (among other things), travellers and locals had all raved about this mountain town, describing it as incredibly romantic, enchanting and picturesque. Although we agree that it was beautiful, and definitely worth the visit if you’re in the area, we felt a little bit let down. 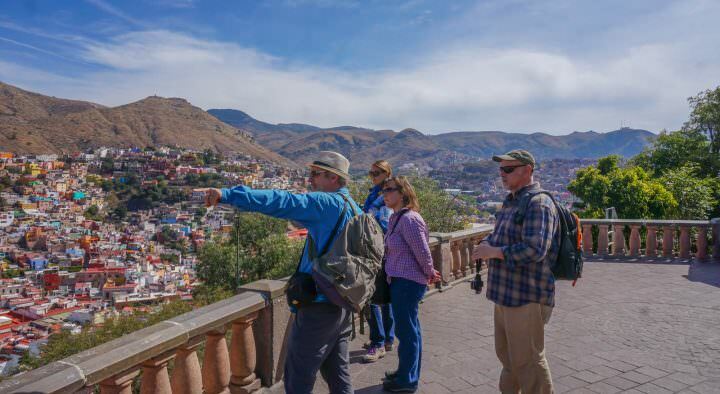 In our opinion, the UNESCO city of Guanajuato and the high altitude town of San Cristobal were both much more aesthetically pleasing and were more enjoyable for wandering around in. After visiting all three, we felt like Oaxaca City simply didn’t live up to the hype. Apart from a couple of small pedestrian streets, the roads in Oaxaca were filled with loud vehicles giving off loads of pollution as they whipped past. The main square (Zocalo) was covered with tented market stalls selling anything and everything you could imagine, not to mention there were a bunch of protesters camping out in the square. 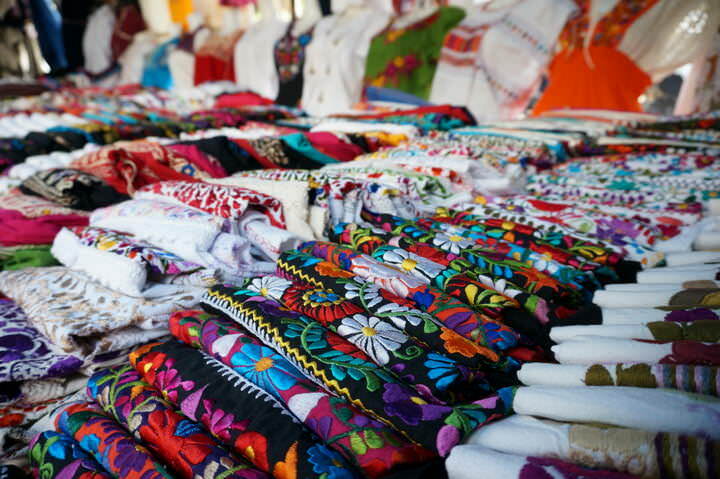 ☞ SEE ALSO: Things To Do in Puerto Vallarta – Don’t Miss These Top 20 Things! The makeshift market and public demonstrations really took away from the views of the cathedral, and robbed the plaza of any space that was left for peaceful relaxation and people watching. 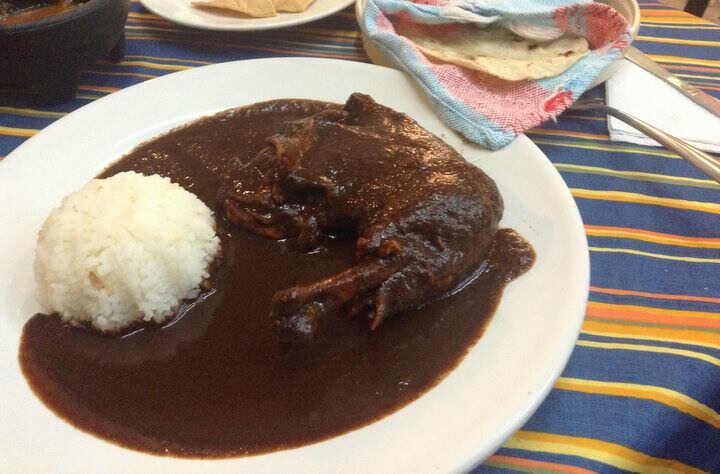 The food was good, but we had better mole sauces during our time in Guadalajara and Puerto Escondido. The cuisine in Oaxaca is meant to be incredible, and although we loved the hot chocolates and the tlayuda (flat pizzas), we were a touch disappointed by what we consumed. The street foods were pretty good, but we much preferred all of the delights on the bustling streets of Mexico City. Perhaps we just didn’t eat at the right restaurants, or sample enough food. Although we as foodies were a bit let down, we did really enjoy the carnivore food stalls at the Mercado 20 de Noviembre! That place was hectic, loud and confusing, but once we figured it out, the result was a delicious plate of meat and sides for lunch. We also found a little hole-in-the-wall place in the suburb of San Felipe del Agua. Run by a local family, this Italian/Mexican restaurant served yummy homemade meals, but even if the food wasn’t good, I think we would’ve still gone back just to spend time with the family. We know that many of the amazing sites of Oaxaca City can be found in the surrounding villages and valleys, but we only managed to visit the Monte Alban Ruins, which were outstanding. We spent our Valentine’s Day wandering around this vast site, gazing in awe at the ancient structures, tombs and carvings. When the sun was at its most intense, we sought shelter under one of the few trees with awesome vistas over the valley below. This was a definite highlight of our two weeks in the State of Oaxaca. Check out our quick video of Monte Alban Ruins here. In the end, we didn’t feel as though Oaxaca City was worth the flight from Mexico DF. It just didn’t have the same vibe as other cities in Mexico and was lacking in quiet plazas and squares. The busy traffic really took away from the old buildings and anything that was happening on the sidewalks and streets. There were a couple of nice pedestrian-only walkways, but even they were broken up by rows of intersecting traffic. We saw many women dressed in beautiful, authentic clothing and numerous indigenous people, and I’m sure if we had more time and went to the valleys, we would have had a more local experience. The food and coffee were good, but we’ve had some incredible meals and cups of coffee in other parts of the country. The buildings and cathedrals were nice, but we much preferred the vibrant coloured homes and colonial architecture in Guanajuato, Guadalajara, San Cristobal and Mexico City. 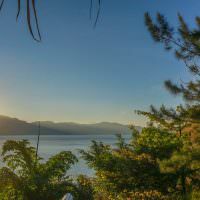 We wouldn’t say give Oaxaca City a miss, but if you had to choose between the five cities listed in this article, perhaps consider giving the others priority. Sorry Oaxaca, we felt the romance, but we’ve definitely had better. Ok, let’s hear it! 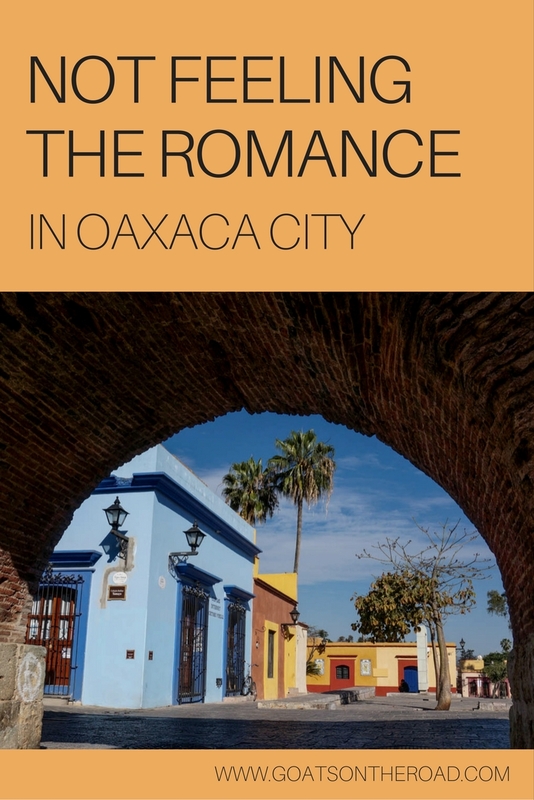 Have you been to Oaxaca City? What were your thoughts on it? Thanks for sharing Katie – I’m not crazy!! 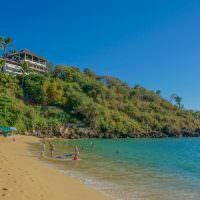 Definitely the same for us with Puerto Escondido – we really loved Playa Carrizalillo, but the rest was not our style. But I have to say, what a great spot to celebrate your 30th!! I have to say I sort of agree. In the end, we stayed 2 to 3 weeks and while I definitely look back fondly and had some great meals, it didn’t live up to all the hype that was heaped on it, but maybe it was the people who put the hype on it’s fault, and not Oaxaca CIty? We didn’t leave town, we just stayed in the center and ate at the street stalls for weeks and I would have to say it’s a great place, just buckling under the pressure of too many foodie people hyping it up. I was impressed with the Mezcal culture though! Wow! 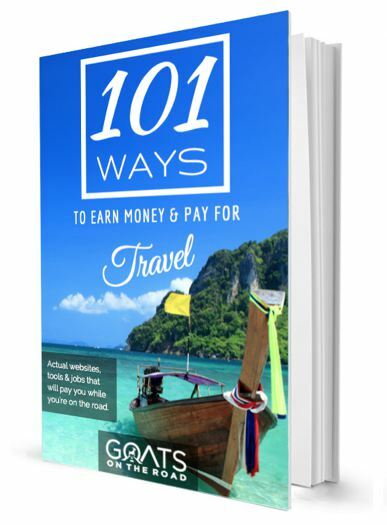 2 – 3 weeks in the city? Now that’s my kinda slow travel, awesome. Having said that I still that its a nice city and there are some great sites in the surrounding area (like you, very impressed by Monte Alban).. But Oaxaca certainly not my favorite place in Mexico. I’m glad I’m not the only one who thought this way! Guanajuato isn’t even in the same league as Oaxaca City if you ask me. The surrounding sites were great, but it just didn’t have the same feel/vibe as other cities. I’ve heard Great things about Puebla!! Definitely bummed out that we missed that. Will have to check it out next time. Sorry David! It had it’s great points, that’s for sure, but we much preferred Guanajuato, Guadalajara, San Cristobal and even Mexico City. Have you been to those cities in Mexico as well? I had the opposite experience, I loved Oaxaca City and found Guanajuato to be beautiful but not my thing. This is likely influenced by a few things. I am disabled (mobility issues) so getting around Guanajuato meant lots of pain for me. The weather was poor while I was there, which also didn’t help. I enjoyed the arts festival – and had planned that portion of my trip around it. I ended up leaving two days early because I just wasn’t having fun. I was in Oaxaca City for Dia de los Muertos, so that probably makes the city more glamourous. It was one of the best parts of my trip. I also rather enjoyed the demonstrators in the zocalo, but I’m an activist back home and enjoy seeing people fighting for their rights (it’s part of what I loved about Mexico in general, seeing protests and the passion of the people all over the country). I will agree on the food in Oaxaca. I was disappointed that I didn’t find the good food until the day before I left. I’m also a vegetarian, so that made eating there very difficult. I fell in love with the cheese though! I loved San Cristobal – I don’t think I’ve ever heard anyone say they didn’t like it – but also for the spirit of rebellion that permeates the area. I’m heading back to Mexico in a month, and can’t wait to see Oaxaca City and San Cristobal again. I can understand why you didn’t resinate with Guanajuato, it’s very hilly for sure and would definitely be difficult to get around in for you. I would love to witness Dia de los Muertos! 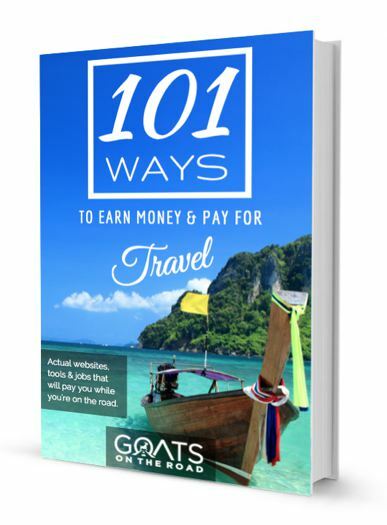 Lucky 🙂 Enjoy your next trip to Mexico – we too love it there. so you mean people actually live there and use modern conveniences, and do not follow “authentic”, “traditional”, old fashioned ways for the benefit of tourists? how rude of them..too bad people in the USA, Canada, western Europe do not shun modern conveniences & live “traditionally” & “authentically” (whatever that means) as well. they would be more interesting places to visit, for sure! I love Oaxaca City, but have also been around the state a bit (Monte Alban, Cuajimoloyas & Lachatao, Mazunte, Tlacolula, San Bartolo Coyotepec, Capulalpam). I don’t recall the traffic being intense at all, apart from the road circling the city. I agree with the commenter above that Puebla is prettier to my eyes and the food is also fantastic there….I get the vibe Puebla isn’t hyped quite as much as some other cities in Mexico, but am not sure why! Pity. Oaxaca is one of my favorite places in Mexico. Yes, it can be a bit gritty, but it’s a real place where people live and work. Even for big tourist-drawing events like Dia de Muertos, the city maintains its true identity. I’m sorry you were let down by the cuisine. I’ve found that it does live up to its name as Mexico’s culinary capital, just don’t eat near the Zocalo! Find the tlayuda cart or taco stand with the long line. That’s where the good stuff is! I’ve spent a cumulative 5 months in Oaxaca and know I’ll be going back. Let me know if you’re ever nearby again, and I’d be happy to point you in the right direction. Aside from the food and the Museum of Oaxacan Cultures, I would say that, yes, Oaxaca de Juárez is massively overrated. But the nearby mountains offer a lot of natural beauty which I’d love to take in more. Maybe hike around the Pueblos Mancomunados, visiting indigenous folks. Wouldn’t go back to Oaxaca City though.